My seed-starting set-up...will it work? Here is my plan for starting pepper, tomato, and eggplant seedlings. I'm going to take a box that's about 4 ft. long and 1 ft. high and maybe a 1 1/2 ft. wide and line the bottom and sides with aluminum foil. In it, I'm going to place two 1020 trays end-to-end with my seedlings. A 4 ft. fluorescent shop light will be suspended about 3-4 in. above the seedlings and will be moved upwards as they grow. It will be on 16 hrs. during the daytime hours. The top of the box will be loosely covered with a piece (pieces) of cardboard wrapped in foil. A space will be left open in the middle to allow for convection. I plan on rotating each flat 180 degrees every three days so that the end plants get to have some time under the strong center light. Since there will be a lack of air movement, I'm going to brush the plants with my hand every day or so to strengthen them somewhat. About two weeks before I plant them, I will take them out from under the lights and begin hardening them off. It is this lack of air flow that has me concerned, though. I'm considering cutting 1 in. holes around the box at the level of the base of the plants. This should lead to more air circulation, but will also lead to loss of light. Would cutting these holes make a good difference, or would it just defeat the purpose of lining the box with foil to make use all the light? So, what do you think of my set-up and whether or not I should go with the holes? Thanks for any comments and suggestions. I think your set up sounds pretty good... except the lack of airflow. I start alot of tobacco plants which are in the nightshade family along with tomatoes, peppers and eggplants, and even potatoes. Weak stems is the result of lack of airflow, we normally place a small fan on them. Is there some way that you could place a small fan somewhere in the box? You want the tiny plants to move, it doesn't have to be on the whole 16 hours, but at least 1 or 2 per day. One problem especially with lack of airflow is damping off. This can be pretty much prevented with.... milk. Milk is an excellent anti-fungal, and it adds nitrogen. I use 1 cup of powdered milk per gallon of water, and use it to water the plants. You could also get some compost and make some compost tea, to give your plants a boost. I think that you should try your idea, but try to get some airflow in some way. How about an airpump, with a small airline tubing stuck into a hole? I am sure you could come up with some kind of idea. I guess the air-flow factor is pretty important. To deal with the weak stems, I planned on brushing the tops of the seedlings every day or so. That is recommended even with proper air-flow, from what I've heard. It's the disease problems that I'm really concerned about. Thanks for the tip about the milk. Does it have to be powdered milk, tough; can I use regular liquid milk? I don't have a small fan, but I do have a large, widow-type one. One thing I could do is make a "door" on the end of the box (foil on the inside) and open it and stick the window fan in front of it for an hour. This would send air down all the rows of seedlings. I'd keep the other end closed so that the air would have to circulate through the whole box. How does this sound; would the large fan be too much for the plants? Is there a reason why you would like to have a bottom boxed it that high? I'm glad you like the set-up. The reason for the box is that by lining it with foil, I will be able to capture the light and keep as much of it on the plants as possible. I figured that since the light a plant gets from a fluorescent light is only a fraction of what it would get from the sun, this wouldn't be a bad idea. The height of the box will allow me to keep the light contained even though the plants will be growing taller. So, the fan is too much; it's only about 1 ft. across (8 in. across the blades), by the way? I like the oscillating idea, but my oscillator is a large one, about 18 in. across the blades and 2 ft. across the cage. I could, however, make the 1 in. holes along the bottom of the box, about at the base of the seedlings, and just position the big oscillator about 3 ft. away. It all seems unnecessarily complicated -- you build up the sides and cover it thus reducing the airflow and then you go to all kinds of work to put the airflow back in. 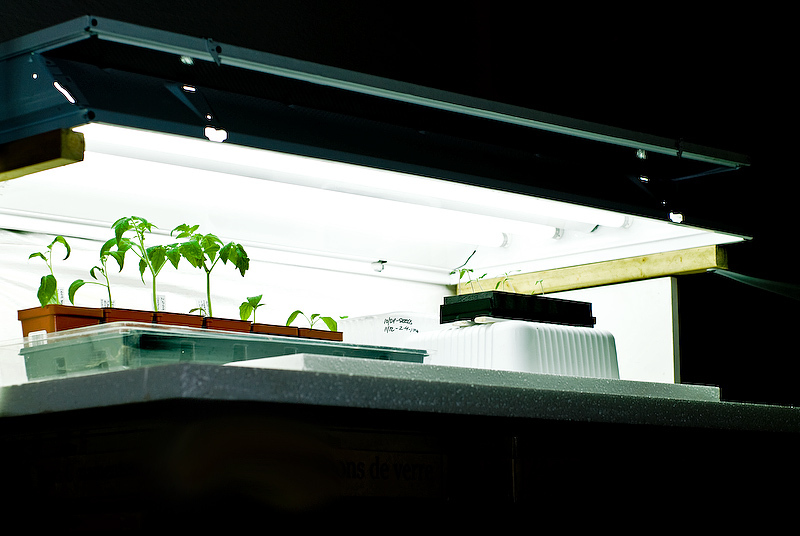 If you just have your trays under the lights with no box they should get plenty of light (as you mentioned, the lights just a few inches above the plants and on 16 hrs a day) and then you don't have to do all the other stuff. I have to agree with Rainbow... And that is why I asked for a reason of you building up high sides. If there is enough of the light source available to seedlings - you really would not need to put the extra effort into materials and time constructing the lower box. I'm not sure what your budget is for this setup (though this is really one time investment that would last for years), but if you were to exclude the cost involved for building a base, I think I would suggest put that budget toward a larger lighting setup. Lowe's (at least one in our area) has 4'x2' light panels on sale $34, it is deep, provides plenty of light and using T8 tubes (4), up to four 1020 trays of good coverage of light, overall reflective area is better than $9-$12 single or dual tube units. Speaking of a breeze, fan - as long it is on low setting, and far enough to provide just a gentle breeze, if you can achieve that with either one of your fans, I think you would do just fine. Thanks for the opinions, everyone. Yeah, I have a bad habit of taking simple things and making them complicated . You were right about the light, Duh_Vinci, It's 4 ft. long and holds two bulbs. I would like to have a bigger one like you do, but that's probably not going to happen this year. That's the reason for the foil-box: to make the light go a little bit farther. Also, I'm only using 2 1020 trays, so they will both fit under the light. I will turn them every few days so they all get a chance to be under the more intense center light. Perhaps I'm being too concerned about the light. I think I will cut large holes in box, down low at the base of the plats, and put up my standing oscillating fan a few feet away so the plants only get hit lightly. The room does not have any real air-flow to begin with, so I'll need the fan anyway. Even though there will be holes in it down low, I think that the light box will still benefit me more than not having one. Thanks, again, everyone, for the advice. OK, I found what I think will be a good answer to my lack of air-flow issue. A pocket-fan! It looks like this one. I was thinking I could put it inside the box, up high so as not to be blowing directly on the seedlings. If I keep the sides of the box solid (no holes), the air should circulate nicely. What do you think (besides that I should throw the stupid box in the garbage )? There ya go. I use the air flow from a cool mist vaporizer, that also helps my humidity.... it should work. How about mirrors? Can you reflect any light from outside, to assist your electric ones, and bring in full range? I am always running into make do, or adapt situations... reusing... etc. We are gardening to save money, but to save money we have to spend money... That is difficult sometimes, when the choices are seeds or equipment. You know how I warm my seedlings? I set them on top of my refrigerator in saran wrapped trays, till they germinate. Then no more saran wrap, but a lamp for the top of the fridge, until they all have to be moved for the next bunch, and then moved to more light too. I go with southern windows... all the daylight that I can get, and sometimes, I use mirrors to increase my daylight. My "trays" are often, rerun take out food containers... It is the 'in' thing in some circles, ha ha.... But really you can eat out for what some containers cost... so just do it.. On the bright side, once you have the containers, you can reuse them... even styrofoam coffee cups can be washed and re-used. I finally broke down and bought two seedling warmers today, but they're not really seedling warmers, they're regular heating pads. I read someone on a blog saying they've used them for ten years with no trouble, so I'm going to try it. They were only $13. each and when my garden gives me a headache and a backache, I'll have another use for them!! OK Rainbow, credit where credit is due, I'm so glad you posted that and I hope others look into it too. I looked at cheap-mart, but the guy in the gardening department had never heard of heat mats for plants (duh), so as I was leaving I checked the health aid dept. and got the last two they had. Thanks so much for mentioning it or I'd never have thought of it. PS. I read so much, I can never remember where I read something but I never hesitate to pass on some helpful advice (wanted or not)! Your setup will be fine. Just keep the light close. Lets talk seed flats that work for you! Seed growing soil mixed with with rice might work!